Do you need a Christmas play for other age group? 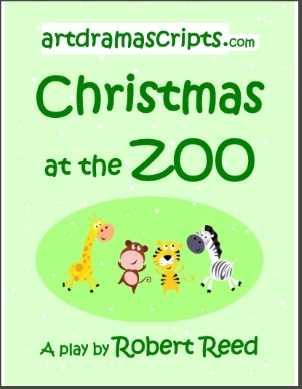 See our range of scripts for Winter/ Christmas assemblies productions for other age groups. You can find plays with Santa and the Chrismas message as well as funny panto scripts like Snow White or (Cinder) Ella that are ofter used for school Christmas shows. The zookeeper is slightly suspicious that something strange is going on when he sees Timmy the giant tortoise on a skateboard. His suspicions are confirmed when the flamingoes start wearing pink legwarmers. And, what's more, the baby animals are decorating their enclosures with tinsel and looking very excited. The truth is out there. Maybe, it has something to do with Christmas? Baby monkey and his friends tiger cub and polar bear cub are playing hide-and-seek when they discover a Christmas card showing Father Christmas giving presents to children. They ask the wise parrot for the meaning. The baby animals hope that if they are good, Father Christmas will deliver presents to them too. Do you need scripts for other occasions? Find scripts for KS1 or KS2 assemblies. Or choose from Kindergaten/ Early Years drama activities.